Today, 25 states and the District of Columbia provide statutory language that allows for the comprehensive use of medical marijuana.1 With growing legal momentum for medical marijuana, it is no longer a question of if it will impact workers’ comp, but when and how. So now the question becomes: what might that future look like from a claims management perspective? Although cases are few and far between, payer reimbursement for medical marijuana has become a reality. In Minnesota, Maine and Connecticut, workers’ comp insurers have issued reimbursements for medical marijuana after traditional therapy failed to improve patients’ quality of life. Last year, New Mexico ruled in favor of reimbursing medical marijuana in workers’ comp claims. However, the vast majority of states either do not require reimbursements for medical marijuana or leave reimbursement to the insurer’s discretion. Because the Department of Justice has left the regulation of marijuana to the discretion of individual states, 25 states with medically legal marijuana means 25 sets of legislation and regulation for payers to keep up with. The workers’ compensation industry must have the agility to incorporate medical marijuana rules into their existing claims management infrastructures as states come forward with radically different regulations. These different regulations will not only cause complexity in determining compensability, but in gauging appropriateness from clinical and cost perspectives. For example, some states programs allow for inhaled medical marijuana, while others only allow forms such as pills, oils, vapors, patches or tinctures. With different formulations come questions of varying dosages, routes of administration, drug interactions, pricing, drug sourcing, and much more. Further complicating the issue in workers’ compensation are individual employer policies regarding the use of medical marijuana by their employees, and specific workplace risks associated with marijuana use. Implementing new claims management protocols for medical marijuana will be an enormous undertaking, and such policy restructuring will require significant education of all stakeholders. Industry decision-makers must gather information as they decide how medical marijuana will fit into claims management systems, while claims professionals will need guidance on how to manage medical marijuana as it appears in future claims. While education is critical at this stage, it is important to understand that the flow of information based on quality research on medical marijuana is currently limited due to its Federal DEA Schedule I status. This severely limits the general understanding of marijuana among healthcare providers and workers’ compensation professionals alike. Without a firm understanding of marijuana, it is difficult to establish best practices upfront in terms of patient care. Downstream, it will create issues regarding claims management. As such, there is the risk for decisions to be made regarding medical marijuana without fully comprehending how it impacts the injured worker. But in the absence of established guidelines, the reality stands: there are states allowing for the medical use of marijuana, and there are judges who are ordering workers’ compensation insurers to reimburse it. Right now, the best we can do as an industry is examine the evidence we have at hand, while preparing for the future. 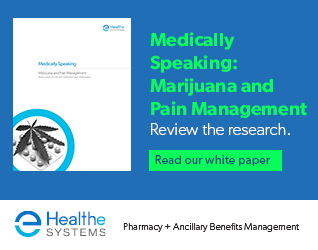 In the effort to guide industry leaders towards currently available research on medical marijuana, Healthesystems’ latest white paper, Medically Speaking: Marijuana and Pain Management, delivers an analysis of the potential risks and benefits of medical marijuana for the injured worker. 1State medical marijuana laws. National Conference of State Legislatures web site. http://www.ncsl.org/research/health/state-medical-marijuana-laws.aspx. Published June 8, 2016. Accessed June 22, 2016.